Since 1985, Linda and Takeshi Akaogi have been farming organically in Westminster West, Vermont on the Earthbridge Community Land Trust. Over the years, they have planned their ten acre farm to use the landscape and grow fruits and vegetables sustainably. 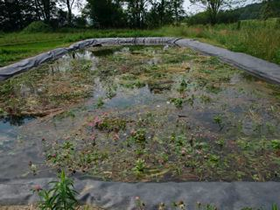 Throughout the farm there are wet areas unsuitable for traditional agriculture. Growing rice in these marginal lands seemed to be a possible solution. With this idea, the Akaogis focused their efforts to research the potential for growing paddy rice sustainably and productively on their farm. Initially, the project was limited in scope to what the Akaogis could manage on their own while running their farm business. Starting in 2006 with assistance from state and federal agencies (Natural Resources Conservation Service, United States Department of Agriculture, Vermont Agency of Natural Resources, Vermont Association of Conservation Districts, Vermont Department of Agriculture) and university faculty (Cornell University, University of Vermont), they were able to construct a rice paddy system and field trial varieties of rice that might be able to mature in Vermont's short, cool growing season (Photo 1, Photo 3). In 2008 and 2009, they applied for and received Northeast Sustainable Agriculture Research and Education (SARE) grants that helped support their rice research and education efforts. Over the years, they have field trialed over 100 varieties of rice, conducted production comparisons, held rice growing workshops, and developed educational materials. As a result of this progress, over the next few years a National Science Foundation (NSF) funded project through the McCouch Rice Laboratory at Cornell University will support the Akaogis efforts by: developing additional educational materials for organic growers interested in rice production in the northeastern United States; hosting this information on a project website; encouraging collaboration with agriculture, conservation, and rice research scientists; and organizing an annual summer workshop and compiling the proceedings. Although five seasons of experience has shown that growing rice is possible and productive at Akaogi Farm with yields of around 2 ton/acre, there are several issues and challenges. Rice is a tropical plant that has been domesticated and bred over time to expand its growing area to colder climates. Rice is currently grown all over the world in a wide range of climates and environments. It is grown in northern Japan (on the island of Hokkaido), northeastern China (Manchuria), and North Korea at latitudes similar to that of the northeastern United States. This northern extreme for rice is influenced by: climate, elevation, length of growing season, and availability of rice seed. 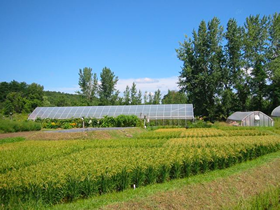 Akaogi Farm, which is located in southeastern Vermont at an elevation of 900 feet above sea level, is at the northern extreme for rice production. The growing season fluctuates from year to year but research has shown that on an average year at Akaogi Farm many of the Hokkaido varieties of rice are able to mature and produce seed. However, farmers in the northeastern United States are unfamiliar with rice agriculture and there are limited resources available for this climate. The most comprehensive rice research and breeding program for northern climates is located in Hokkaido, Japan. Researchers and rice breeders in Hokkaido have been investigating rice for over a hundred years. The wealth of genetic and agronomic information that exists for this northern rice growing region is difficult to access because most of it is in Japanese. In addition, rice breeding in Hokkaido is focused on short-grain varieties popular in Japan. No other types of rice (e.g. basmati, jasmine) are currently available to grow in this climate. The McCouch Rice Laboratory at Cornell University has acknowledged this need and will focus on new varieties that will provide some variation for the rice grower and consumer market. An important factor that allows rice to grow in northern climates is the resourceful use of water. Water management is key to ensuring that rice seedlings are able to survive the cool nights in the early part of the growing season. Water added to the rice paddy in the early morning absorbs heat from the sun during the day and holds this warmth during the cool night. Efficient use of water can help raise the temperature around the rice seedlings higher than the surrounding landscape and support plant development in this cool climate. Because water is necessary to grow rice in this northern climate, it is important to consider sources of water and whether the amount of water diverted to the rice paddies will negatively impact the surrounding watershed. A rice paddy is a shallow pond with a flat bottom that can hold 6-8 inches of water, provides for control of water depth, and is able to drain completely (Photo 1). A rice paddy system consists of a warm up basin (reservoir), one or more paddies, and irrigation channels (including ditches, pipes, etc.) (Photo 2). Once a rice paddy system is established, it begins to function as a manmade wetland supplying many of the same benefits that natural wetlands provide. Wetlands are areas where the land is saturated with water for at least part of the year and are protected by federal, state, and local regulations because so many of them have been developed. In the United States over 50% of wetlands have been destroyed since European colonization, a percentage of which were converted to agricultural land. Using marginal farmland to construct rice paddies will provide some of the lost wetland functions and can help support protected wetlands and the ecological benefits they provide. Over the years, the rice paddy system at Akaogi Farm has attracted many wildlife species. The Akaogis have noticed an increase in the numbers and species of waterfowl, reptiles, amphibians, and macroinvertebrates. Knowing that many wildlife species are now depending on the rice paddy system for part of their life cycle, the Akaogis would like to manage rice production in a way that will also accommodate ecological considerations. Their goal is to balance agriculture and conservation. In order to achieve this goal, more research and knowledge is needed about the wildlife species that use the rice paddy system. The first step is to conduct a species inventory. As these species are being identified, existing ecological information about each species can be compiled. Cataloguing these species, their life cycles and habitat requirements will take years of extensive research by educated professionals. Another area of inquiry will include active research projects that investigate species of interest within the rice paddy system. These target species will need to be determined and projects will focus on how these species interact with other organisms and their surroundings. Are these species able to survive in the rice paddy environment? Are there specific ecological conditions that these species need to survive that are lacking in the current rice paddy system design and crop management routine? How does the whole system work together as an ecosystem? Are there ways to improve the existing fragmented habitat and increase connectivity in the landscape? In addition to these examples, many other research questions can be investigated that are important to the future of sustainable rice production in the northeastern United States. Two major groups of organisms that rely on the rice paddy system for habitat are frogs and dragonflies. The Gray Treefrog and Common Green Darner will be used as examples of these two groups of organisms to demonstrate the complexity of wildlife conservation in this context and the need for more research. The Gray Treefrog (Hyla versicolor) is common across Vermont but infrequently observed because it spends most of its life cycle hidden in trees (Photo 4). 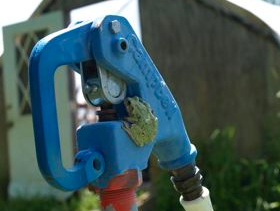 Starting in early May, Gray Treefrogs travel to slow moving or standing water with abundant vegetation to reproduce (Photo 5). The tadpoles develop within a span of months and transform into young treefrogs between June and August. 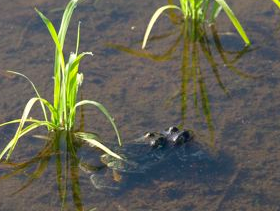 Rice seedlings are transplanted in May and are already a foot tall in June when Gray Treefrog tadpoles begin to transform (Photo 6). Rice paddies appear to provide Gray Treefrogs with adequate habitat during their reproductive and juvenile phases. Water is present in the paddies when they are laying their eggs and the rice plants are large enough to support them when they transform into small treefrogs and transition to a terrestrial lifestyle. However, in order to accommodate Gray Treefrogs some thought must be placed into the proximity of forested areas, which they require for their adult phase. 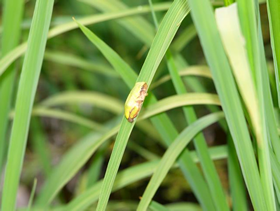 If they are a target species, research will be needed to verify these observations and investigate rice paddy system design, crop management, and landscape planning options that will support Gray Treefrog conservation. 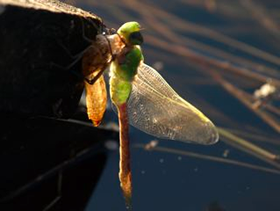 The Common Green Darner (Anax junius) is present throughout Vermont from as early as mid- April to November and uses a wide variety of wetlands, including well-vegetated ponds and lakes. Adults perch low in grasses and weeds and hunt over upland fields, dirt roads, and hilltops. Females deposit eggs beneath the water surface in aquatic vegetation (Photo 7, Photo 8). Immature dragonfly nymphs spend most of their time crawling among and clinging to stalks of aquatic vegetation, or hiding under rocks and woody debris. This larval stage lasts from one to three or more years. Nymphs emerge close to the water, usually on stalks of vegetation, where their abandoned exoskeletons may be found (Photo 9). In contrast to the Gray Treefrog, the Common Green Darner life cycle does not work as well with existing rice paddy management. 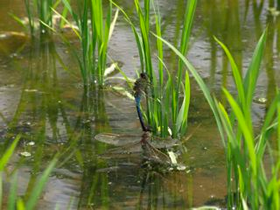 Although the rice paddies are well-vegetated bodies of water that are available from May to September, they don't easily fit with the darner life cycle because the paddies are dried out in the fall to harvest the rice. 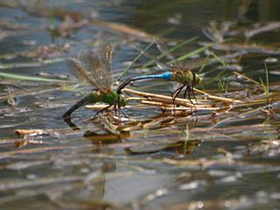 Darner nymphs need more than one season to mature and need habitat through the winter months. Because there is no water in the rice paddies and they freeze during the winter, it seems that dragonfly nymphs are unable to survive. However, dragonfly nymphs seem to over winter in the reservoir, which consistently holds several feet of water. If the reservoir can be designed to include vegetation, perhaps the Green Darner can use that component of the rice paddy system. Each part of the rice paddy system can be designed to provide habitat for a different target species or set of target species. If the Common Green Darner is a target species for wildlife conservation, research will help answer these questions. 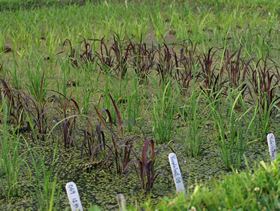 Research will provide information about rice paddy system design and rice crop management techniques that will support conservation of target species and also result in productive rice agriculture. Based on research and experience at Akaogi Farm, future management recommendations for small-scale rice paddy systems in the northeastern United States should take into consideration watershed issues, wildlife ecology, and agricultural requirements. In addition, providing education to growers and consumers about rice will ensure both a supply and demand. Addressing these issues through additional research, education, and outreach will support the ultimate goal of a sustainable rice production system for the northeastern United States.